Shopping for a hot tub can sometimes seem as overwhelming as it is exciting. 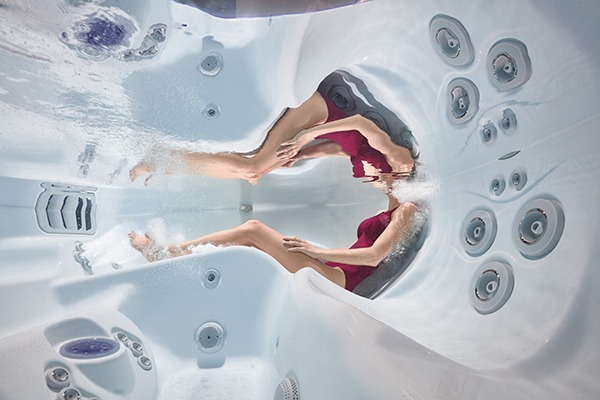 You might feel as if you’re underwater with so many amazing spas and features to choose from. But it’s also a great opportunity to envision a whole new chapter in your life. What will bringing a hot tub home look like for you? Will it provide balance and relaxation? Holistic wellness and healing? Socialization? A bit of everything? Answering these kinds of questions first will help to simplify your search and bring you closer to your ideal home spa from the start. Now is the perfect time to step back, envision that next chapter, and then take the steps to put it in motion. This guide will help you bring into focus what you really want from your home spa experience, and will equip you with ideas and questions to take to your local dealer, so you can feel confident and motivated about the next steps. What Kind of Spa User Are You? One of the best things you can do before buying a hot tub is sit down, close your eyes, and imagine what it will be like when you have your hot tub finally installed in your home. You’ll discover in your search that a hot tub is no longer just a hot tub; today’s advanced spas are designed to perfectly address users’ varied needs. Some hot tubs are better for certain objectives than others, and a knowledgeable dealer can help lead you in the right direction as soon as you’re clear about what you want from your spa experience. Click here to find questions for the dealer about the best hot tubs for personal renewal. Click here to find questions for the dealer about the best hot tubs for rejuvenation. 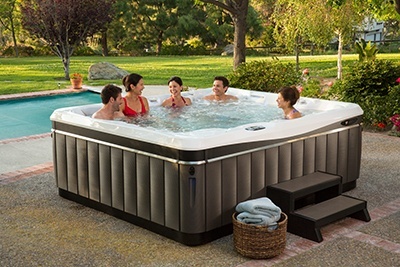 Click here to find questions for the dealer about the best hot tubs for warm reconnection. Are you drawn to more than just renewal, rejuvenation, or reconnection alone? With the best hot tubs, you won’t have to choose. But any insight you can uncover about your priorities and preferences will help make your hot tub search smoother and more focused. In preparation for your visit to the hot tub showroom, feel free to pull questions from more than one category below, and to expand on these questions in order to deepen your understanding of the options. You’ll find additional questions about performance and service further below, and those answers will be important for everyone interested in hot tub ownership. You may also find our pricing guide helpful as you start to narrow your options. Planning ahead can ensure that your home spa brings with it ultimate tranquility and relaxation—a true retreat in the comfort of your own home. 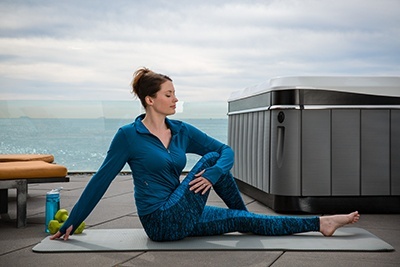 You’re seeking a hot tub that helps you easily find peaceful rest, meditation, and renewal—and one that will not introduce new stressors with complicated controls and spa care needs. 1. How easy is it to operate the controls and turn the spa to my preferred settings? ○ In a showroom, a dealer should be able to show you the control panel up close and give you a real sense of how intuitive the controls are. They can also highlight the various conditions you can adjust and how to find your personal settings. 2. How do hot tub sizes, water quality systems, and any other features bear on the overall ease of use? ○ If you are seeking simplicity and easy operation, let your dealer know, so they can help guide you to the models and options that will be truly stress-free. Some spas conveniently offer easy system care and additional stress relief in one place, such as with hot tub water care and aromatherapy. 3. How quiet are these hot tubs when the jets aren’t in use? ○ Sometimes you simply want silence. 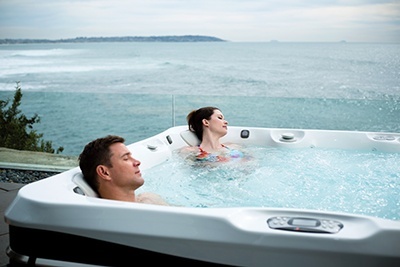 A knowledgeable hot tub dealer can point you to the hot tubs with silent circulation systems if that’s a priority, so your tranquil sanctuary remains one. Click here for questions about reliability, service, and maintenance. Your new home spa has the potential to bring wellness and rejuvenation together in one relaxing new routine. Especially for those with active lifestyles, a hot tub is your opportunity to reset before the next adventure. You need a spa designed for immersive massage and relief for the body and the mind. 1. Does this spa offer hydrotherapy that fits my specific physical relief needs? ○ If you can give the dealer an idea of where you hope to find relief—is it your back, your legs after a run, or your total body?—they’ll be able to introduce you to the spas with jet massage elements and systems that best address your needs. 2. To what extent can I adjust the jets and customize my massage experience? ○ In the showroom, a dealer can show you the control panels on their hydrotherapy models and demonstrate the versatility—as well as the overall power—of the jets for your purpose. We recommend you at least test out the jets on your arm, though a full test soak would be your best route to matching the hot tub to your vision. 3. Does this spa have an option for cold water therapy as well as hot? ○ The best home spa brands now offer advanced accessories to cool your spa water in record time, so you have even more choice in your therapeutic sessions. Your dealer can give you further details and ideas for making the most of this unique technology. Introducing a spa into your home can bring endless possibilities for real connection and quality time. You’ll find this inviting potential with larger hot tubs that are adaptable for different users and that offer impressive styles and entertaining features. 1. When the specifications say that a hot tub fits a certain number of people, does that estimate allow people room to stretch out and be really comfortable? And is the layout conducive to my vision for entertaining? 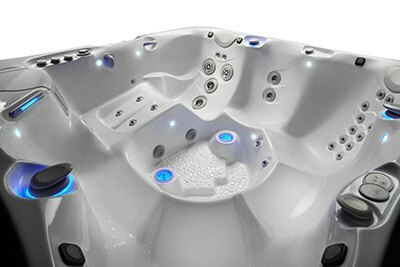 ○ An experienced dealer can help you interpret the capacity range typically given for different hot tub models—especially if you help them understand how many people you’re interested in hosting regularly, and what type of seating arrangement is ideal for your group. 2. What features does this spa have that make it appealing to a wide range of users? ○ You and your guests may be interested in gentle water quality chemicals, temperature versatility, and entertainment upgrades. Your dealer can introduce you to the exciting opportunities for customization based on your plans for spa use, and also give you a complete picture of any additional costs or maintenance required. 3. Do you offer any services to help integrate a hot tub logistically and aesthetically into your client’s homes? ○ Dealers who are committed to quality user experience are interested in successful integration of each spa into their client’s home and lifestyle. Listen for the services they offer during installation—but also those they offer afterward, throughout the life of your hot tub. 1. What warranties does the manufacturer offer? Does the dealership offer any additional warranties? ○ The best hot tubs are manufactured with durable materials, innovative design, and efficient technology. Those manufacturers and dealers are willing to stand by such quality, performance, and reliability. Different parts will likely have different warranties, though, so make sure you’re clear on how everything is covered. 2. How complicated is cleaning and maintenance of this model and any additional features I’m interested in? How much will chemicals and maintenance cost each year? ○ Today’s top brands are designed for the user experience, even when it comes to care and maintenance. The dealer can define those regular maintenance tasks you can easily be responsible for yourself, as well as the services they offer from qualified, experienced technicians. There are even hot tub systems available that offer less intensive or less expensive maintenance options, if that’s a priority for you. 3. What is the average electrical cost to operate this hot tub model in this area? ○ All hot tubs call for a different amount of power, and it will also depend on the cost of electricity in your area and how you intend to use your spa. Your dealer can walk you through those estimates. 4. Are there any accessories or upgrades you recommend to extend the life of the spa and its components? ○ Some features—such as lighting and entertainment—are excellent additions to your home spa experience, and other items—such as a convenient cover lift and water quality products—are important for the resilience and long life of your spa. Your dealer can help you identify what additional items to prioritize in order to maximize your investment and enjoy your hot tub for many years to come. 5. How much communication and dedicated service can I expect from you and your technicians now and into the future? ○ Dealers who are interested in positive customer experience will make themselves available to their customers, and will provide or direct you to the services you need to be exceptionally happy with your spa. Spending the time to really understand how your hot tub will become a part of your home and your life is the best first step for a smooth shopping experience. Don’t underestimate the wonderful benefits a home spa can bring: be willing to imagine your ultimate experience for renewal, rejuvenation, or reconnection—or all of the above. So it’s time to bring this conversation to your local showroom in order to match that vision to a personalized home spa package—with quality hot tub, service, and upgrades included. Your home and lifestyle reset is just around the corner. For renewal, rejuvenation, and reconnection alike, you can turn to Caldera® Spas and our nationwide community of knowledgeable, caring dealers. Click here to download a brochure. Now is the time to discover what your personalized home spa lifestyle can be, so locate your nearest showroom and request a price quote.